Available in Medium and Large models, portable Flex-Lifter(TM) safely lifts fully loaded troughed or flat conveyor belts from underneath using adjustable wings or return lift bar, respectively. Beltline maintenance tool, designed for belt widths from 36-60 in. (Medium) and 48-72 in. (Large), raised to max vertical lift heights of 14 and 16 in. Made of anodized aluminum, units can be operated by ratchet, drill motor, or impact wrench. DOWNERS GROVE, (IL) - Flexible Steel Lacing Company (Flexco) has announced the introduction of Flex-Lifter(TM), a conveyor belt lifter with a 4,000 lb. (1,810kg) safe lift rating, the highest available for today's conveyors. The portable, versatile beltline maintenance tool is designed to safely lift fully loaded troughed or flat conveyor belts. The Flex-Lifter lifts troughed belts using adjustable wings, and flat return belts using a return lift bar included with each unit. 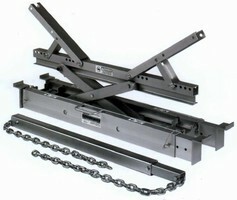 The Flex-Lifter is available in two models. The Medium Flex-Lifter is designed for belt widths from 36" to 60" (900mm to 1,500mm), while the Large Flex-Lifter is for belts from 48" to 72" (1,200mm to 1,800mm). Adjustable extension legs slide out to fit the conveyor structure. Lifts are made from underneath the belt without the need for potentially damaging clamps on the belt's edges or cover. Both Flex-Lifter models are designed for safety and operating efficiency. When raised, they provide ample workspace for safe, easy changing of worn idler rollers, maintaining impact beds or establishing a splicing station for belt repairs. The Medium model achieves a vertical lift of 14" (350mm), while the Large model reaches 16" (400mm). They can be operated by a ratchet, drill motor or impact wrench, enabling workers to lift the belt while safely standing at its side. Standing only 6-3/4" (169mm) high in the closed position, the compact units fit and extend easily in confined areas. Designed with a carrying handle, the durable units are also easy to transport and place in different locations along the conveyor belt line. The Medium Flex-Lifter weighs 60 lbs. (27kg), while the Large model weighs 74lbs. (33kg). All of the units are made of anodized aluminum for long-lasting durability. Stainless steel moveable pins provide corrosion resistance. Introduction of the Flex-Lifter expands Flexco's line of portable belt maintenance tools for efficient, economical repairs and productive conveyor belt operation. The line also includes belt cutters, skivers and clamps. Flexible Steel Lacing Company (Flexco) is headquartered near Chicago, IL/USA, and provides the world's belt conveyors with efficient, safe products, services and solutions for mechanical splicing, slippage, belt tracking and cleaning. The company is based in Downers Grove, Illinois and operates subsidiaries in California, Michigan, Mexico, England, Germany, Australia and South Africa. Flexco markets its broad line of products through a worldwide network of distributors, under the brand names which include Flexco®, Rockline®, and Mineline(TM). The company will celebrate its Centennial in 2007. For more information, visit Flexco's website at www.flexco.com, or contact the Customer Service Department, Flexco, 2525 Wisconsin Ave., Downers Grove, Illinois, 60515-4200, USA. Phone (630) 971-0150; fax (630) 971-1180.